Massage chairs are available in every price range. However, you might still need to do a lot of background work on what features you get at what price. We tried our best to cut short that tedious selection process. We reviewed the best massage chairs from each price segment, compared them against each other on every feature. Additionally, there are links that shall lead you to detailed reviews on each one of these massage chairs. All the best!! 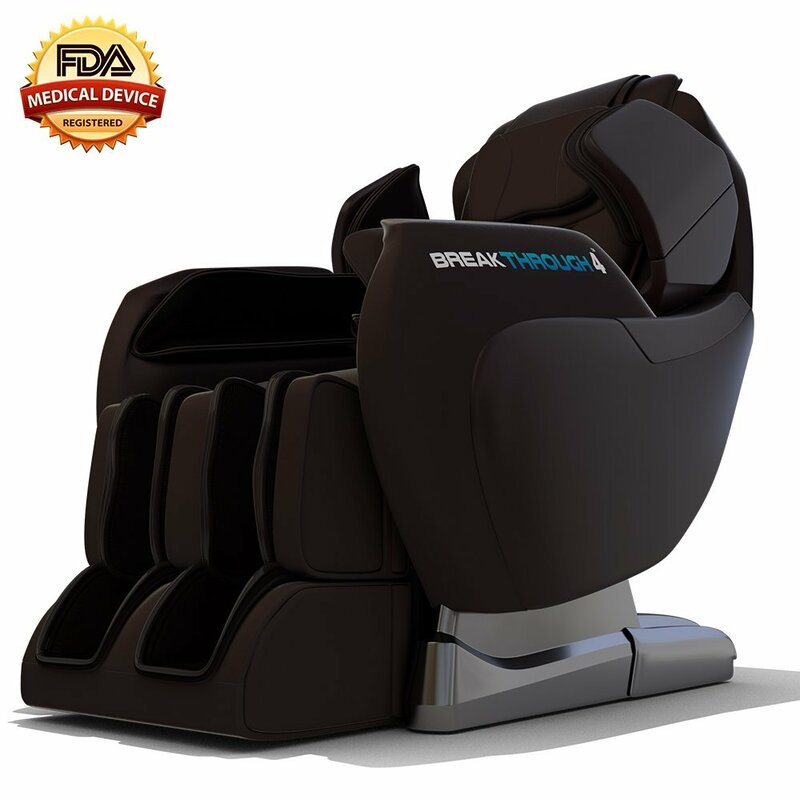 Medical Breakthrough is in fact, the topmost one in high-end massage chairs segment. It is designed after extensive collaboration between physicians and design engineers. It is highly suggested for people who have been suffering from chronic body pain issues for a long time. Most suitable for sports persons as well as those who spend loads of time at workplace and who do exhaustive physical work that might land them with chronic pain issues anytime in the future. 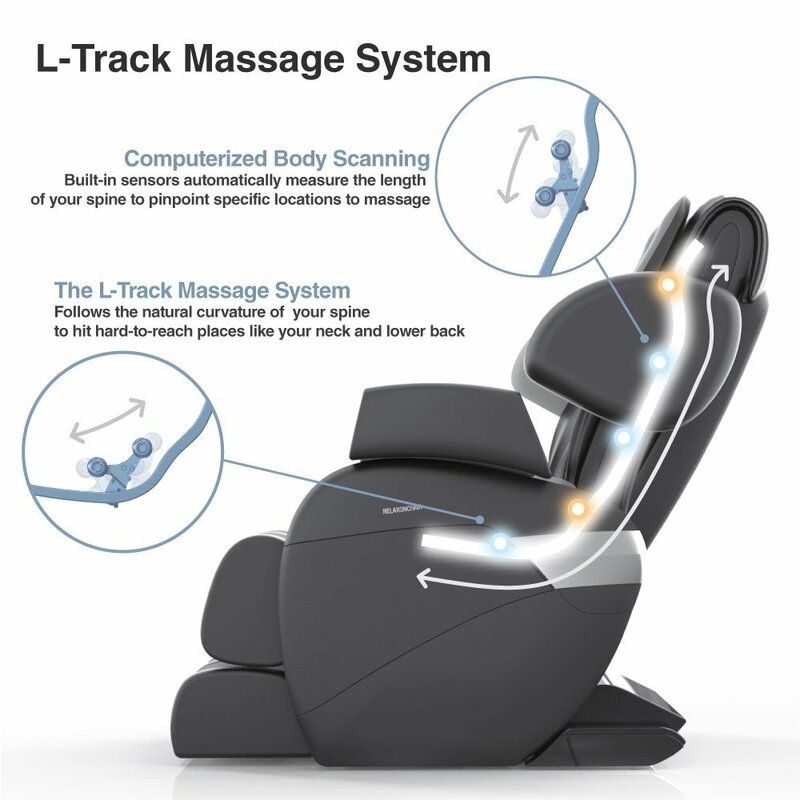 L-Track design embedded in Medical Breakthrough 6 chair means quad massage rollers cover entire of your back and up to your lower thighs. The body scan feature in Medical Breakthrough chair is relatively advanced and accurately measures every inch of your back including spine curvature. I would rather say this is the best option that’s usually not seen other chairs in this price range. It comes with 2 memory savable positions. This means you can adjust the massage functionality (rollers, airbags and feet/calf massage parameters) and save them as your desired massage settings. Next time, just at the touch of a button, the massage initiates to your favorite parameters. 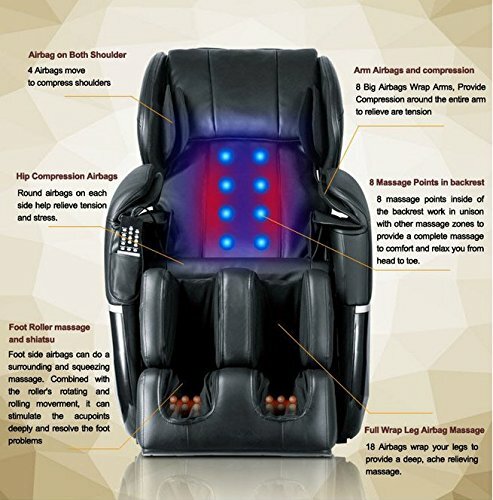 With 6 auto massage programs and 4 massage techniques, Medical Breakthrough chair also includes an out of the box feature. The width between the backrest quad rollers can be adjusted between narrow, medium and wide. This means they can be precisely customized to meet you exact body width. There are three modes and 5 intensity levels for upper body. Built with the latest air massage technology, Medical Breakthrough chair employs minimum 18 bags covering entire of your arms, upper and lower body. Air masssage too is adjustable and there are three intensity levels to choose from (high, medium and low). Along with air massage and roller massage, there is foot scraping for heals and arches plus papillae pairs for finger rotating massage as well. In most other chairs, heat therapy is focussed just around lower back. But the unique heat therapy in Medical Breakthrough chair, distributes heat across the entire back instead of just limiting to lumbar area. In case you wish to enjoy the comfort of resting in a zero-gravity position yet have a space constraint at home, then Medical Breakthrough shall be the right choice. It’s design makes consume less space even in zero-gravity positions. The only chair on the market designed by both engineers and doctors together. Around 25 doctors from various fields put in their expertise in designing this chair. Comfort with cure, Medical Breakthrough 6 chair offers exemplary comfort plus relaxation on one hand and on the other, it serves as a precautionary measure that helps avoid chronic pains to build-up in your body in the long run. Kahuna is the most trusted and reputed brand name in massage chairs industry. While LM6800 is the basic/mid-range massage chair from Kahuna, Superior SM7300 is the top-end model. But cost-wise it still carries a mid-range massage chair price tag. We heard of S track design that covers upper and lower back and L track design that stretches up to glutes. Whereas in Kahuna, the design is somewhat hybrid and is called SL track design that is quite similar to L track design. However, as an added advantage it has 6 quad rollers instead of 4 and the massage experience is superior when compared to all other chairs that come with standard 4 quad rollers. Kahuna Superior SM7300 comes with 3D body scan wherein it has the intelligence to measure every inch of your back along with your precise height and body width. Like in Medical Breakthrough chair, even Kahuna Superior too offers quad rollers width adjustability. As mentioned earlier about the 6 quad rollers, the massage experience shall be better than the rest. Kahuna offers altogether 5 auto massage programs. Very similar to Medical Breakthrough chair, even Kahuna SM7300 offers only one zero-gravity position. It’s a space saving design and that could be the reason why there is only one zero-gravity position that is incorporated. However, the best part is that the distance from the wall even while in this zero-gravity position is just 3 inches. Adjustability is the most exceptional part of Kahuna Superior. It offers both roller massage adjustability and air massage adjustability as distinct options. Roller massage can be adjusted between full, partial or fixed. In full mode, it covers all of your back, in partial you can adjust the rollers to your needed width and in fixed mode, the massage focuses only on the selected precise point. There are different intensity speeds/levels for roller massage and air massage. Air massage has 5 intensity levels and roller massage has 3 speed levels. As heating elements are fixed in lumbar area, heat therapy is simply focused to lower back. It’s the same in all massage chair except Medical Breakthrough where the heat somehow spreads all across the back. 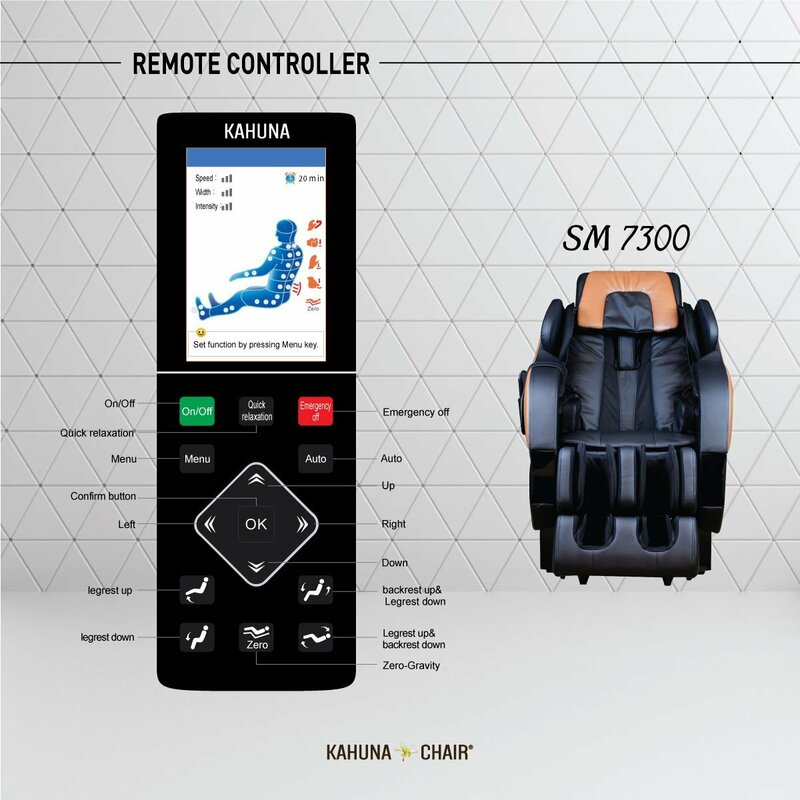 Kahuna Superior SM7300 too adopted the latest technology in air massage. As such the design needs just 18 airbags and comes with 5 different intensity levels. 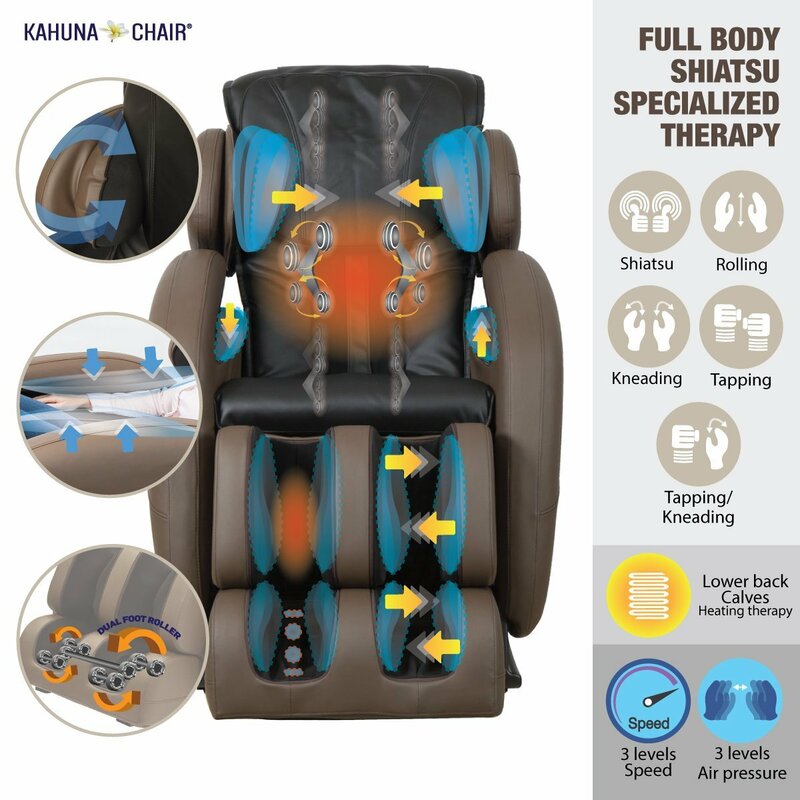 Just like in Medical Breakthrough 4 chair, Kahuna SM7300 too has several options for feet massage. While there is roller kneading for feet soul, the top and heal arches have scraping techniques. Medical Breakthrough has finger rotating papillae as well which is the only option missing in Kahuna Superior. 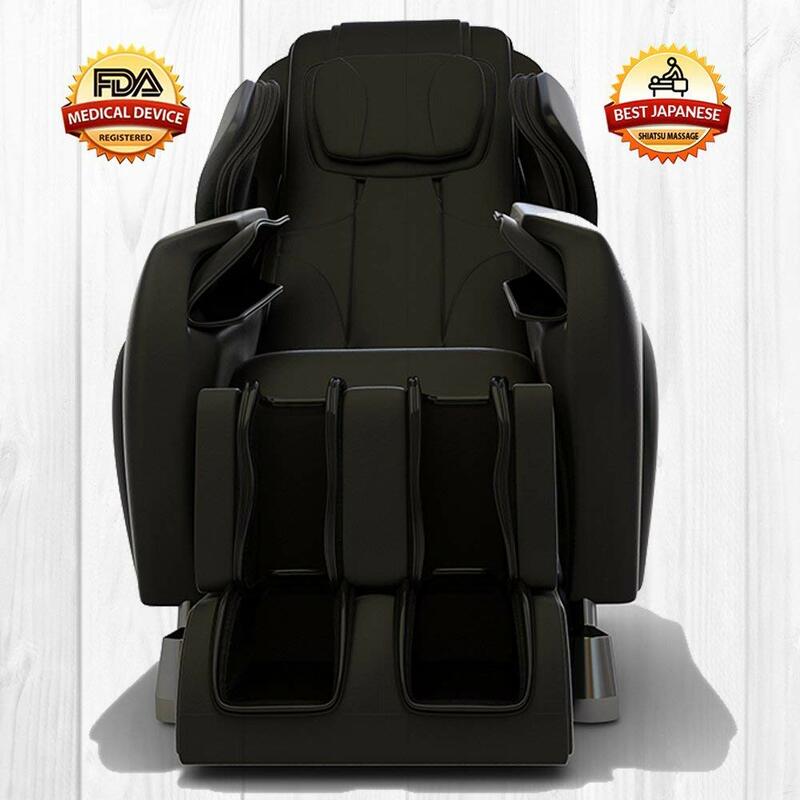 Kahuna LM6800 stands as an undisputed leader in mid-range massage chairs category with highest number of sales and exceptional user rating. Kahuna LM6800 comes with L track design. Until Kahuna launched LM6800 model, L track design was not part of massage chairs in this price range. The computerized body scan feature in Kahuna LM6800 accurately measures your body stats. It measures your overall height and body width. Although, it is not 3D body scan like that in Kahuna SM7300 but it is relatively far better than other massage chairs in this segment. Kahuna LM6800 comes with one 15 minute massage timer. You can time each massage program/technique for 15 mins. 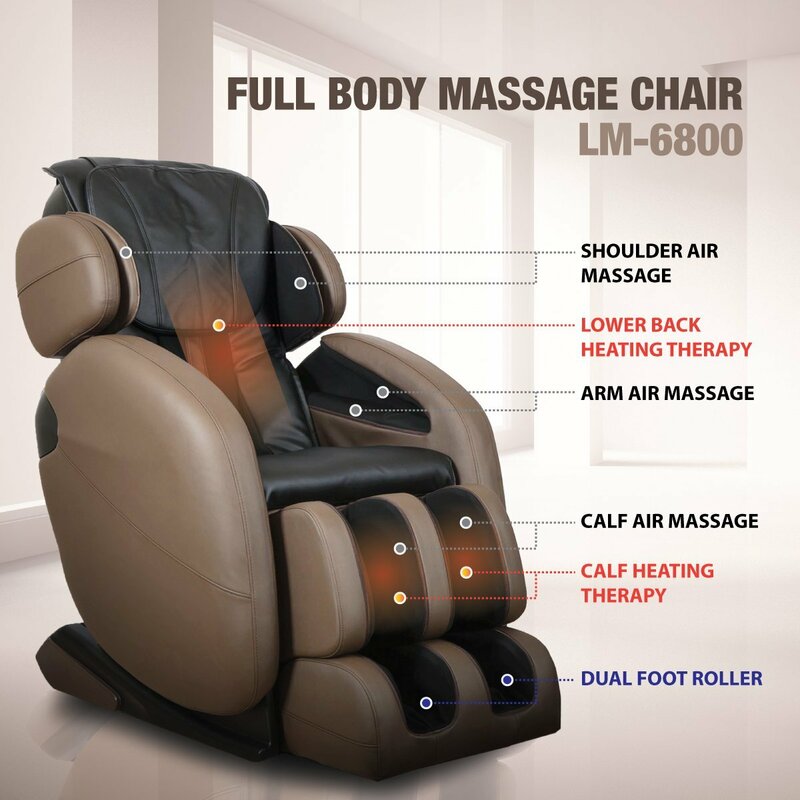 LM6800 offers as many as 6 massage programs and 5 massage techniques with combinations. Yoga is becoming increasing popular. Unlike other types of workouts which mostly benefit you physically, Yoga is the only program right now which has equal emphasis on mind and body. Yoga postures benefit you both physically as well as psychologically. As such Kahuna has incorporate Yoga kind of stretching program in its LM6800 massage chair. This is definitely a big takeaway. While the lower legs beneath the knee has airbags and offers air massage to calves there are dual rollers included in the foot massage unit. The foot massage again has both foot roller massage and air massage. Along with quad rollers, there are additionally airbags too included in the roller section for offering air massage. This is one major area where Kahuna LM6800 scores far better than others. It offers as many as 3 zero-gravity positions while others in this segment offer only one. Another best feature of Kahuna LM6800 is the space saving design which takes as less as just 5 inches extra space in all 3 zero-gravity positions. The number of airbags in Kahuna LM6800 are as less as 36. 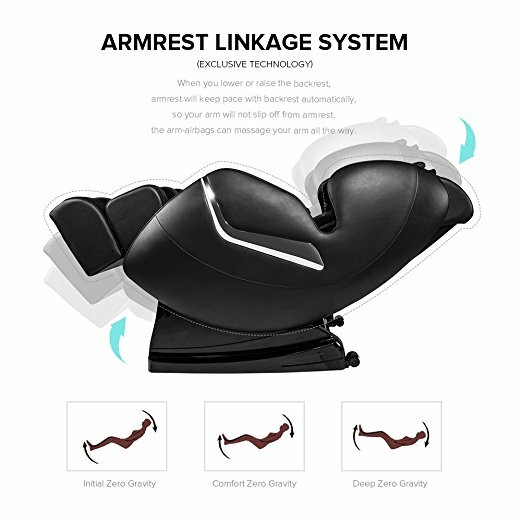 In fact, LM6800 is the very first model that pioneered the technology of using less number of airbags yet offer the best air massage experience. Kahuna LM6800 comes with 3 years warranty on frame, parts and labor. In mid-range massage chairs segment, Relaxon MK-II has shown remarkable performance with decent number of reviews and exception user rating. Please note that we have selected only the best performing massage chairs in these reviews. The chairs that already have proven track record in terms of performance and customer satisfaction. The chair follows custom L track design in which the quad rollers cover entire of your back and glutes but do not stretch through your thighs up to knees. Similar to Kahuna LM6800, computerized body scan is embedded even in Relaxonchair MK-II. Although, not a 3 body scan but still measures your height and weight accurately. Only advanced massage chairs like Medical Breakthrough 4 and Kahuna SM7300 have 3D scan that measure every inch of your back including spinal curvature. Relaxonchair MK-II also offers 3 zero-gravity positions. There are quite a few massage chairs that come with 3 zero-gravity postures. And the leading ones among them in mid-range category are Relaxon Mk-II and Kahuna LM6800. The only feature where Relaxon MK-II massage chair lags behind its contemporaries is the number of massage techniques it has to offer. On the up side, there are wide range of adjustment options embedded on Relaxonchair Mk-II’s remote control. Roller speeds and air bags intensity are both adjustable. Additionally, the roller width can also be adjusted between narrow, regular and wide as per your exact body width. To achieve precise targeted massage, 1. Roller position adjustment and 2. Fixed spot massage options are also provided. 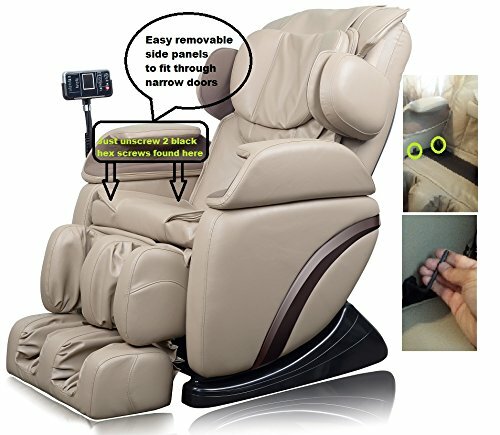 Each of these options are reviewed in this detailed review on Relaxonchair MK-II. This is one area where Kahuna LM6800 lags behind Relaxon MK-II. Relaxon has options to time your massage programs between 5 minutes to 30 minutes. Just check the number of reviews and the overall rating, ideal massage chair is a leading choice of many in mid-range category. The reason is simple – it offers fair number of features that are way more than what we can expect for the quoted price. 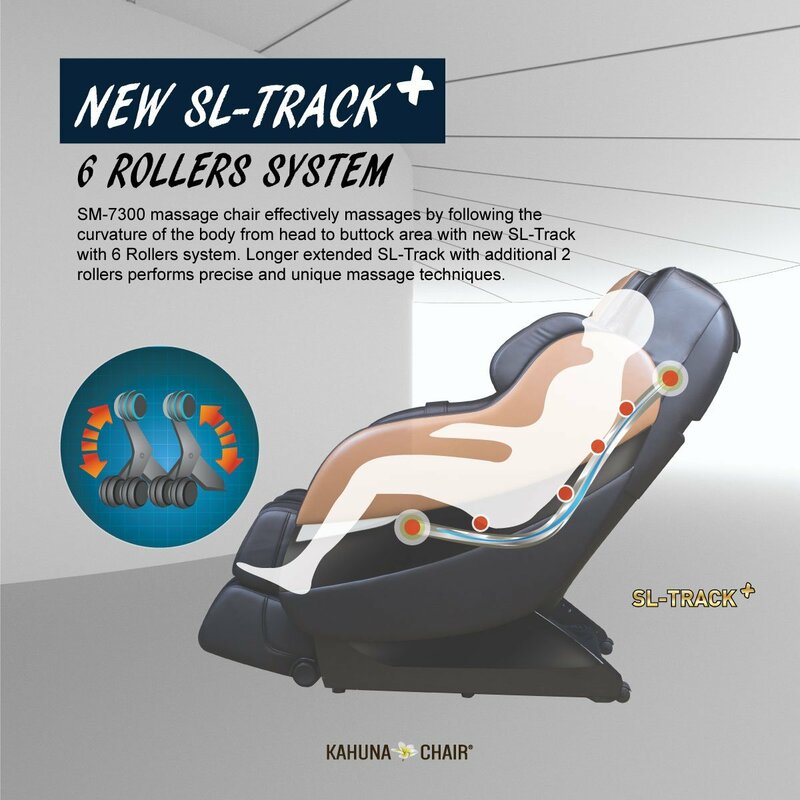 While both Kahuna 6800 and Relaxon MK-II massage chairs come with L track design, ideal massage chair comes with S track design. In S track design, the quad rollers only cover upper and lower back and do not reach glutes and thighs like in L track designed massage chairs. Ideal shiatsu massage chair comes with regular body scan feature that accurately measures your height and body width. It’s not 3D body scan that measures every inch of your back curvature as well. As discussed above, 3D body scan is only available with high-end massage chairs like Medical Breakthrough and Kahuna Superior SM7300. Although, price-wise it is significantly lower than both Kahuna 6800 and Relonchair MK-II but ideal shiatsu massage chair too comes with 3 zero-gravity positions. One of the most notable features of ideal shiatsu massage chair is the number of manual massage technique combinations it has to offer. While the number of auto massage programs and manual massage techniques are 4 each but the massage combinations are 14. This is the highest number of combinations that no other chair, even high-end massage chairs have to offer. Both the roller massage intensity and air massage speeds can be adjusted to desired levels. Dedicated buttons for massage adjustability are embedded on control panel. The one area where ideal shiatsu massage chair scores above Kahuna LM600 and Relaxon MK-II is massage timers. While Kahuna offers one 15 min massage timer, Relaxonchair MK-II has no massage timers at all. 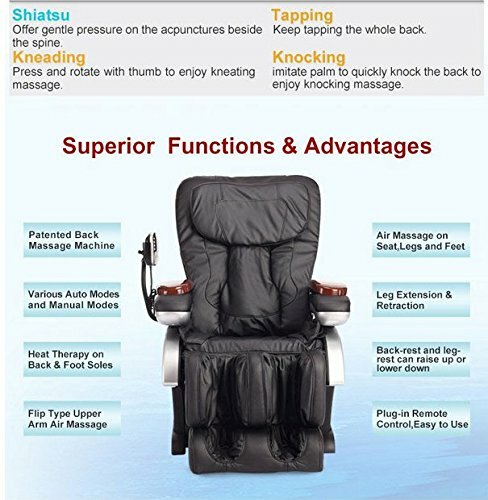 But ideal shiatsu massage chair comes with wide range of time adjustability. Leaving out the backrest, airbags are spread across the entire body area. Around Thighs and calves including in feet rest. Just like roller massage, air massage too comes with different speeds. You can adjust the intensity to your desired comfort levels. Heat therapy is a must for any massage chair and Ideal shiatsu massage chair comes with heating pad placed in the lumber area of the backrest. This heat pretty much covers all of your lower back and upper back. If you are looking for a mid-range adjustable bed with decent features but at affordable price then EC-06 massage chair is definitely a bet. 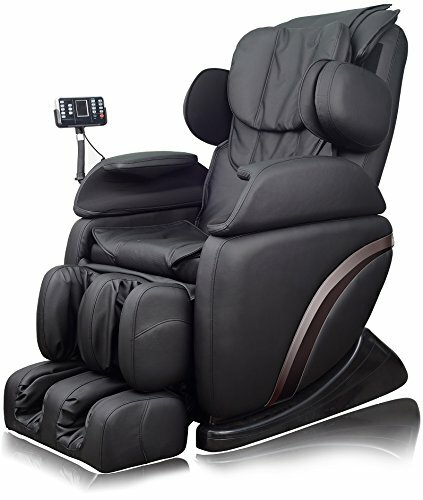 Although low on price but EC-06 Electric Full Body Shiatsu massage chair has all features of a mid-range adjustable bed. It has also secured decent number of reviews and very good overall rating and customer satisfaction. Electric Shiatsu EC-06 massage chair comes with S track roller design wherein the quad rollers are included only in the backrest. Hence, massage is limited to upper and lower back. Electric Shiatsu EC-06 comes with standard body massage. It measures your height and body width accurately. Although 3D body scan is most advanced but only comes with high-end premium massage chairs. 3D body scan has the intelligence to measure even back curvature. 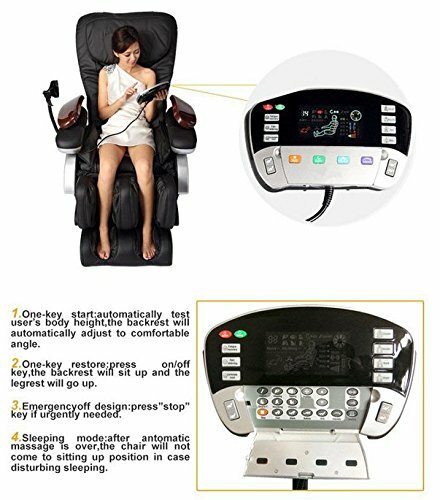 EC-06 massage chair comes with a total of 3 massage programs and 4 manual massage techniques including massage combinations. While heating pads are placed only in the backrest in most chairs but in EC-06C they are placed both in the backrest and the feet soul. Note: The feet massage is limited to air massage and there are no separate feet rollers for kneading feet souls. For both roller massage in the backrest and air massage across upper and lower body there are three intensity levels – Strong, medium and gentle. Even though, you can recline both the head and feet section to your desired angle but it does not come with zero-gravity option on its control panel. It means you have to manually fine-tune both the head and feet section to achieve your desired zero-gravity posture. Alongside massage chairs that have rollers in the backrest, there are again another category of chairs that have fixed point shiatsu massagers in the backrest. And in this category the leading ones are Mr Direct and Real Relax Massage chairs. Cost-wise these are the most affordable of all massage chairs. The massage experience, I would say might not be as superior as roller based massage chairs yet it is pretty much satisfactory. 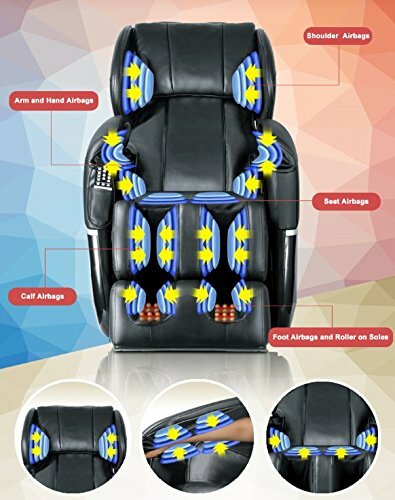 Mr Direct Shiatsu massage chair has 8 fixed point massager units spread across entire backrest. These cover all pressure points, right from shoulders to lower back lumbar area. Massage chairs with fixed point massagers do not need to have body scan feature. The 8 shiatsu massage units are fixed and they cannot be adjusted as your height. In case the massagers are not hitting the right pressure points on your back then you have to do adjust your seating posture. But in any case as there are 8 massage units, they pretty much cover all your back and every critical pressure point. Including feet rollers in this price range is definitely a big takeaway. Other companies mostly offer feet rollers disparately owing to price concerns. However, Mr Direct Massage chair has not just included feet rollers at this price but also included airbags as well. The feet massager offers both roller massage and air massage. Both roller massage and air massage come with three speeds – strong, gentle and light. Mr Direct massage chair comes with single zero-gravity position. Remember that if a chair offers zero-gravity position means it is also a space saver. The reason being that this zero-gravity posture consumes extra space and unless a chair has that space saver design, this position is not included. Mr Direct offers single zero-gravity position, takes minimal extra space and keeps the head section right next to the wall. Heat therapy is a must while treating acute lower back pain. It is most effective and offers immediate results. Instead of just one heating pad, Mr Direct massage chair has two heating pads strategically placed in the lumbar area so as to offer heating across the entire of your back as well as around waistline. Mr Direct massage chair comes with just 1 year warranty. Real Relax is another massage chair with fixed massage units incorporated in the backrest. It does not include quad rollers as in regular massage chairs. 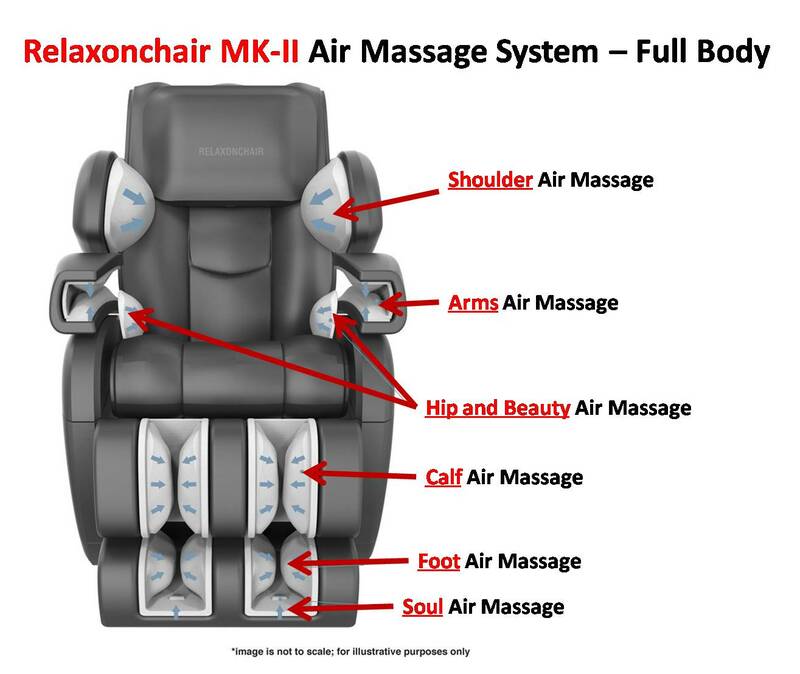 Just like in Mr Direct massage chair, the Real Relax model too has 8 shiatsu massage units. These are distributed around shoulders, neck, upper and lower back. Body scan is not applicable for massage chairs with fixed massage units. There are a total of 4 massage programs but only 2 massage techniques – shiatsu and vibration. Although shiatsu is an exceptional massage technique known for quick pain relief and relaxation but vibration is not exactly a massage technique. It simply vibrates the seat pad and thereby shakes your entire body. It is relatively strong but not as strong that it will throw you out of the chair. 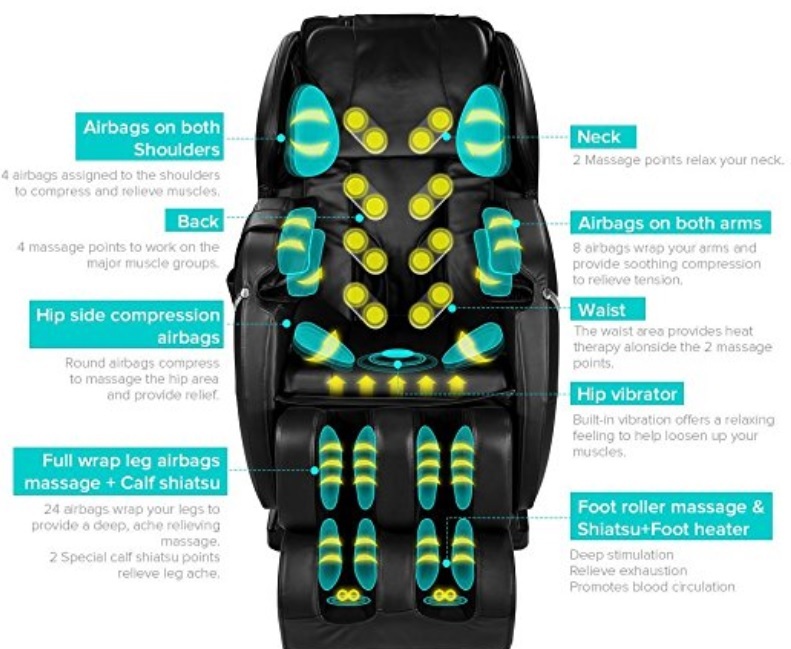 Real Relax massage chair too has 50 airbags that are again embedded across arms, shoulders, upper and lower body and in feet rollers. Both the roller massage and air massage can be adjusted between high, medium and low. The chair comes with dual feet rollers. It has both rollers as well as airbags placed inside the feet rollers. Real Relax chair comes with single heating pad placed in the lumbar lower back region. This when combined with shiatsu fixed massagers and air massage around waistline offers quick pain relief. When physically tired, all we want is to either sit or sleep for sometime so as to relax our body and muscles. Apart from sitting or sleeping, Zero-Gravity is another position that provides ultimate relaxation and at the same time rejuvenates our strained muscles in quick time. What is Zero-Gravity position in first place? Zero-gravity is a posture in which both your head and feet section are lifted slightly upwards while your lower back remains in flat position. Although there are around 3 different zero-gravity positions, the most common and essential position is where the angle between head section and lower back is at 120 degrees and the angle between your lower back and legs is 30 degrees. Adjustable beds offer only single zero-gravity position while massage chairs can have as many as 3 different zero-gravity positions. Is Zero-Gravity position important or a just nice to have feature? It is neither an add-on feature nor a nice to have feature but I would rather say it is a must have feature. I will give you my reason as well. Massage is one option that is primarily focused at relaxing strained muscles or to cure chronic pains. And now add zero-gravity to massage feature, it’s double the experience and the fastest way to relieving pressure and relaxing your body. Just imagine your body is being massaged while you are lying in a floating in the air like posture. That’s heaven like relaxation, isn’t it? What is the difference between roller massage and air massage? Every massage chair offers two types of massaging, 1. Roller massage and 2. Air massage. Rollers are primarily embedded in the backrest of massage chairs. They move up, down and sideways massaging all your back along the spine curvature. S-track design: In S-track design, rollers are present only in the backrest. Hence, the massage is restricted between your shoulders and your lower back. Rollers move along spine curvature starting from shoulders and ending at top of lower back. It covers only your back. L-track design: Whereas, in L-track design, the rollers move all the way from your shoulders, lower back, glutes and thighs. Meaning, the length of the rollers track is stretched beyond lower back and extends all the way up to your glutes and thighs. Feet rollers: In some massage chairs, rollers are also included in feet section that massage your feet souls as well. However, it is difficult to implant these rollers around neck, shoulders, lower arms and top of the feet. In such areas, air bags are embedded that squeeze and release muscles thus relieving pressure accumulated in these areas. It’s similar to the band seen in portable blood pressure machines that is wrapped around your upper arm while measuring your blood pressure. In first generation massage chairs, the more the number of airbags, the better was the air massage experience. However, with advancement of technology, the airbags number is irrelevant. Instead, less number of airbags are now used while the overall massage experience has enhanced. Body scan is a must have feature and is a part of almost all massage chairs irrespective of their price range. The only thing that varies is how accurately this body scan feature works? Some massage chairs come with regular 2D scan while advanced massage chairs have 3D body scan. What exactly is this body scan feature all about? The moment you sit on a massage chair the scanner first measures your body stats, primarily your height and body width. Accordingly, the back rollers adjust and massage your back as per these stats. However, 3D body scan is more effective and measures every inch of your back. This exact information is then fed to rollers which precisely target every nook in your back and follow the spinal curvature as per your height. The rollers also adjust their width so as to cover all your back. Lower back is most vulnerable and most prone for back pain. However, if neglected for long it might result in becoming chronic in nature. Massage is one way to get rid of this back pain and when combined with heat therapy the result is quiet fast and very effective. Hence, opt for massage chairs that come with heating pads placed inside backrest around lumbar/lower back area. But remember that most massage chairs do not have options to adjust the heat. The only way is to wrap a towel or cloth around your waist if you happen to feel the intensity high. Heat therapy along with massage is the quickest of all methods to cure chronic lower back pain.